Zeus is an infamous name in Ancient Greek mythology as he was God of the sky, lightning, thunder, law, order and justice. Ruling as King of the Gods in Mount Olympus he took on the mantle when he overthrew his father Cronus and imprisoned him in Tartarus, but how does Zeus from WMS compare to the competition of the various other Greek mythology themed online slots that exist? Zeus has proved to be one of the most popular WMS slots in their history - both at online casinos and brick-and-mortar casinos in Las Vegas. With an eloquent Xylophone tune playing out as the reel’s spin, the soundtrack is relaxing rather than adrenaline pumping with swords clashing together like we have encountered in other Greek God themed slots like Microgaming’s Thunderstruck II slot machine. Consisting of 5 reels and 30 paylines Zeus can be played from 1p to £5 per payline therefore you can play all paylines from 30p up to £150 per spin, plus there is an incredible free spins mode to enjoy and reap the rewards of! The reels are set on a bright blue sky with the Golden Olympus adorning the top of them with the Zeus logo beside it, and it’s all things Greek on the reels with symbols designed to make you feel like you’ve travelled back to the Ancient Greek era where Zeus ruled with an iron fist, and thankfully there are no boring playing card symbols from video poker machines included as Greek related items have been used instead. It’s Mount Olympus where Zeus ruled that is the main symbol to watch out for as it acts Wild and substitutes for all others aside from the Scatter. In this case the Scatter is the iconic hand of Zeus clutching a lightning bolt and this is required to access the free spins mode. Of course, Zeus himself makes an appearance along with the Wined Horse Pegasus, a boat, Greek warrior helmet, a harp which was a classic instrumental choice for Greeks, a vase, gold coin, silver coin, and finally a wreath - which is the lowest symbol of all! It’s not very frequently that you’ll land five Scatter symbols in one spin, but as you can see, when you do you’ll be reaping the benefits of the combination to the tune of 100 free spins which practically guarantees huge wins. More often than not it’s going to be 10 free spins you trigger, but the great news is that you can retrigger more free spins as you play by landing three or more Scatter symbols again. Wild symbols also become stacked as your free spins play out which produces even more winning combinations! 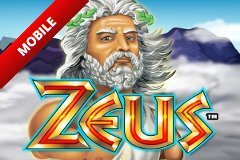 Zeus has been one of the most played WMS slots ever since it was released, proving so popular that just like the Wizard of Oz slot machine, there have been several sequels to this original Zeus slot machine with Zeus 1000 and the Zeus III slot machine now available too. The whole design portrays the historic Ancient Greek theme with the highly detailed Zeus symbol being the standout symbol on the reels and all the usual items related to Zeus featuring as you’d expect, such as Pegasus and Mount Olympus. It’s pretty disappointing that there is only one bonus feature to play but thankfully it is highly rewarding with up to 100 initial free spins on offer and Wilds being stacked as they play out – a combination sure to give you God-like wins!